1) List my business name, “Sassmuffins”, on all my Etsy listing tags, so that people can find me easier. 2) Invite my friends to my business Facebook page. 3) List my Etsy shop as SassMuffins.etsy.com, rather than http://www.etsy.com/shop/SassMuffins. Whew, much easier on the eyes. I’ll have to remember this on future advertising. 4) Join Austin Craft Riot (formerly Etsy Austin), a local group of artists, crafters, vintage & supply sellers promoting the handmade revolution in Austin, TX! 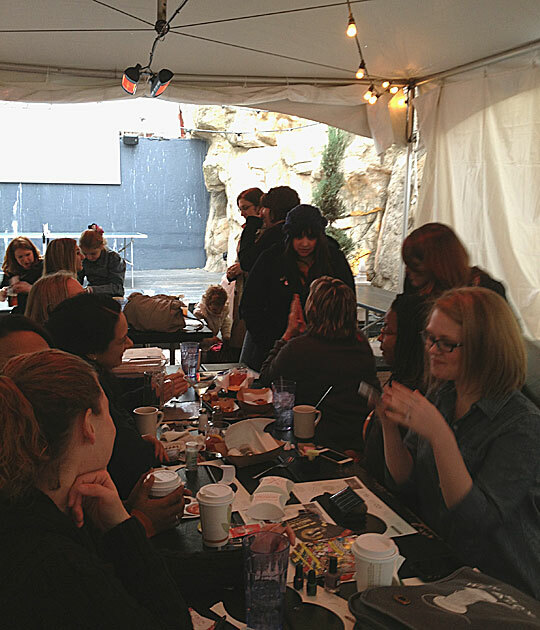 All in all, this was a super get together for Etsy staff and sellers. I am definitely going to join Austin Craft Riot for their monthly meetings (every month except November/December), so I can learn even more. Thank you Etsy for bringing us together in Austin! This entry was posted in Business, Etsy and tagged Austin Craft Riot, Easy Tiger Bake Shop, Etsy, Etsy Austin, Etsy Home for the Holidays. Bookmark the permalink.